1 foil stamped area on Side 1 of uncoated 100lb Burgundy Linen stock. H1 business card slits on right pocket. 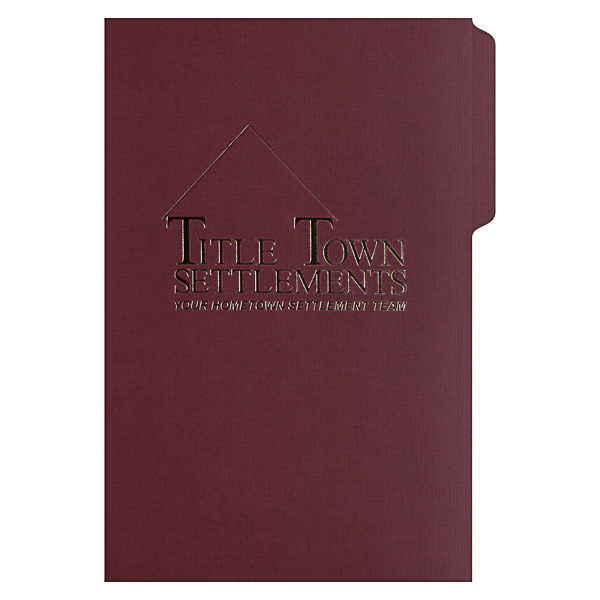 Metallic Gold foil and Burgundy Linen stock emphasize Title Town Settlements' color branding. The rich red tones and shiny gold imply luxury and wealth. A customizable file tab lets recipients write their own label for the folder's contents, while contact information on the back makes it easy to reach Title Town with any questions about their purchase or refinance settlements. Both sides printed with 2 PMS colors using light coverage. 100lb Smooth White stock uncoated. C1 business card slits on left pocket. 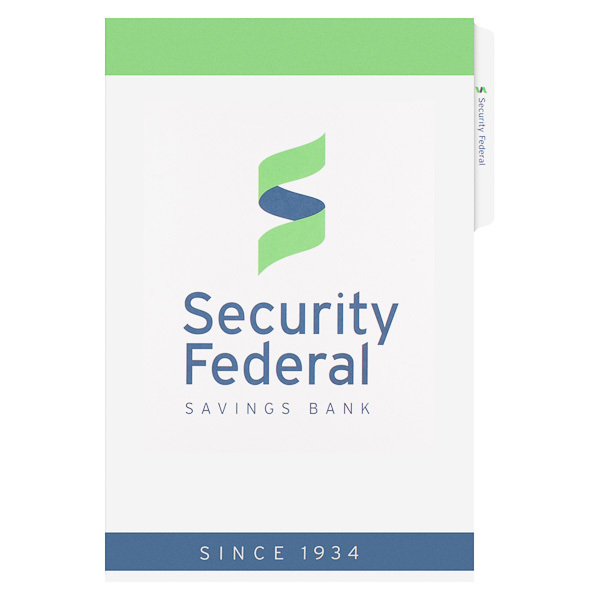 Bright green and navy blue color branding grace the cover of this design for Security Federal Savings Bank. Its green accents symbolize money, while the navy blue's corporate color suggests stability and trust. A branded file tab helps customers find their banking documents. Service lists and contact information on the back cover also help them find the nearest branch to meet their financial needs. Side 1 printed with 2 PMS colors using light coverage. 100lb White Smooth stock uncoated. H1 business card slits on right pocket. Title Town Settlements uses subtle color to reinforce its brand identity. Maroon ink and gold accents play up Title Town's corporate color palette, which creates a luxurious, sophisticated look. Forms on the front cover help clients track purchase or refinance settlements, while a blank file tab lets them write in a label. Contact information is on the back panel, which is mostly blank to provide space for additional notes. This design's two interior pockets secure 8 1/2" x 14" legal contracts, closing papers, and other documents. The top file tab is positioned to be the first thing viewers notice about the design. 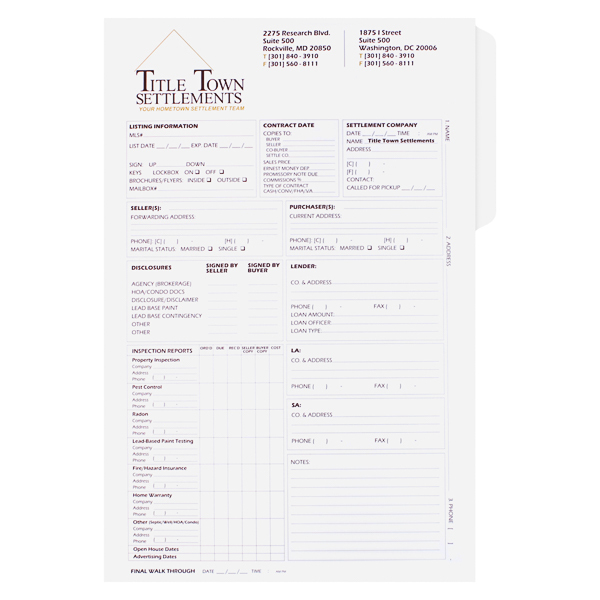 Its 1/2" width provides plenty of space for your brand's name or contact information; you may even leave it blank and let your clients write in their own label. Slim, portrait-oriented panels have ample room for design elements, such as logos, illustrations, or a pattern in your brand's colors. Dimension Closed: 9 1/2" x 14 1/2"
Dimension Open: 19" x 14 1/2"